The National Wetlands Research Center (NWRC) "is a source and clearinghouse of science information about wetlands in the United States and the world for fellow agencies, private entities, academia, and the public at large." The NWRC Library Digital Collection contains an abundance of technical reports in pdf format spanning the last couple decades from such institutions as the US Fish and Wildlife Service; the USGS Biological Resources Division; and the National Biological Service. The site also contains an archived Species Profiles collection from the US Fish and Wildlife Service with 126 downloadable profiles "designed to provide coastal managers, engineers, and biologists with a brief, comprehensive sketch of the biological characteristics and environmental requirements of the species and to describe how populations of the species may be expected to react to environmental changes caused by coastal development." 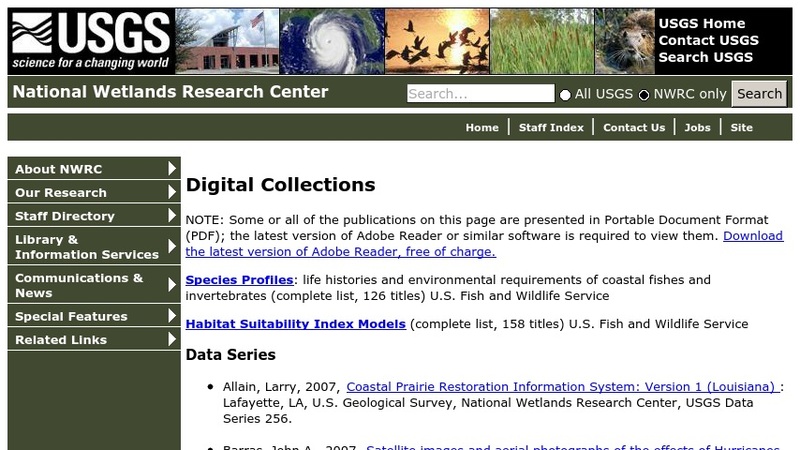 The Library Digital Collection archives contain a Habitat Suitability Index Models Series and a Waterfowl Management Handbook from the US Fish and Wildlife Service as well.